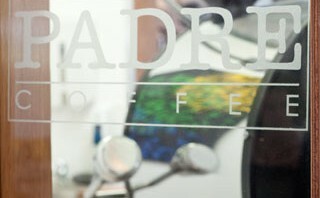 The words ‘hand crafted’ are subtly frosted onto the Project’s window, and they set the tone for the cafe. Care and heart are apparent in the ceramics that stand in for coffee cups – an homage, perhaps, to Brunswick’s pottery-making past. Photography, paintings and sculptures by locals feature about the cafe, along with less local, drought-resistant greenery and sacks of bean-bulging hessian. There’s an obligatory bicycle chained up outside, and room about the roaster to discuss yoga poses, parenting, academic theses or a perfect home-brewed espresso. The Padre blend, in espresso form, is as thin as a slip, with a rich toffee nose and provocative acidity – worth missing the tram for. The malt aroma of my latte gives way to a brittle burst of brandy-snap on the palate. This entry was posted in testcat and tagged 4.5 bean, Brunswick, Padre. Bookmark the permalink. Very nice coffee. Always like it when I don’t have to put sugar in my coffee. Friendly service. Good atmosphere. Doing reno’s so would be good to see when finished. Nice coffee though.